This suede-like material shows off the sophisticated side of 86. Granlux® 31 trim accents covers key touch-points on the door panels, upper-seat bolsters and dash. Adding an extra bit of style is an embossed “86” logo above the passenger-side glove box. 86 features an ergonomic, leather-wrapped steering wheel that feels great in your hands and, thanks to the smaller diameter and quick-ratio steering, feels amazing in the corners. And that’s not all—with integrated audio controls, you get easier access to your music, helping you stay in control of it all. Available LED fog lights seamlessly integrate into the sculpted front bumper of 86. Designed exclusively for 86, these fog lights fit inside the aerodynamic canards, ensuring a perfect fit. Not only do these help provide more light when the weather gets foul, they take the sporty look of 86 to a whole new level. Vortex generators on the fenders help control turbulent airflow, enhancing the stability of 86. These also work to keep the front end planted firmly to the ground, so you can stay connected to the road. When you got it, flaunt it. 86 shows off its performance cred with a chrome-tipped dual exhaust. Constructed from high-grade, corrosion-resistant stainless steel, this cat-back exhaust system features mandrel bends for smoother airflow, helping optimize the performance of 86. This suede-like material shows off the sophisticated side of 86. Granlux®1 trim accents covers key touch-points on the door panels, upper-seat bolsters and dash. Adding an extra bit of style is an embossed “86” logo above the passenger-side glove box. 1Granlux® is a registered trademark of Oy Granula Ab Ltd. Deeply bolstered front seats bring comfort to those long drives, and they hold you in place when the roads get twisty. Granlux®2 trim on the upper side bolsters provide extra grip and an added sense of luxury. And accent silver contrast stitching further enhances the premium feel of 86. 2Granlux® is a registered trademark of Oy Granula Ab Ltd.
A standard folding rear seat lets you bring your friends, or your gear, along for the ride. With 6.9 cubic feet of space in the trunk,3 you can fit those gotta-have items you need for a weekend getaway. Folding the rear seat down increases total cargo area, giving you enough space to carry an extra set of wheels and tires for those race-day excursions. 3Cargo and load capacity limited by weight and distribution. Available on 86 is the Display Audio with Navigation4 system. Unique to the Toyota family, this powerful piece of tech features a high-resolution 7-in. touch-screen display. Its navigation functionality with turn-by-turn directions makes it easy to find your way. Better yet, this system also comes standard with the Aha Radio™ app5 with over 100,000 stations, iPod6 connectivity and six speakers, helping power the perfect soundtrack for every drive. 4Be sure to obey traffic regulations and maintain awareness of road and traffic conditions at all times. Availability and accuracy of the information provided by the navigation system is dependent upon many factors. Use common sense when relying on information provided. Services and programming subject to change. Services not available in every city or roadway. Updates may be available from your dealer at an additional cost. See Owner's Manual for details. 6Aha Radio is a trademark of Harman International Industries Inc. Apps/services vary by phone carrier and are subject to change. Data charges may apply. At the heart of 86 is a potent 2.0-liter flat-four engine. With its horizontally opposed pistons and compact packaging, this engine sits low in the chassis for optimal balance and performance. 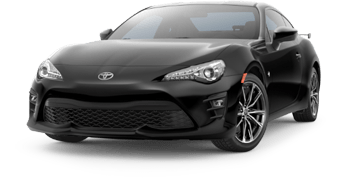 In the manual transmission-equipped 86, this engine reduces friction and pumping loss, helping to provide an optimized power curve. 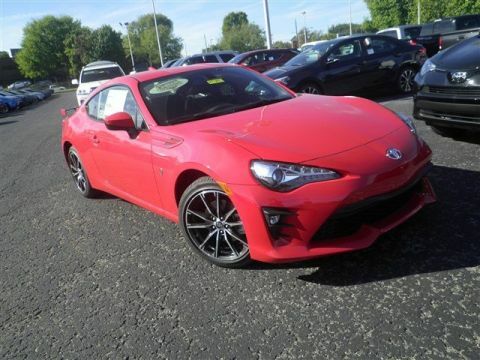 It’s got some muscle, too, with the manual transmission-equipped 86 getting 205 horsepower and 156 lb.-ft. of torque, plus a red aluminum intake manifold. In the automatic-equipped 86, its Boxer engine pumps out 200 horsepower and 151 lb.-ft. of torque. 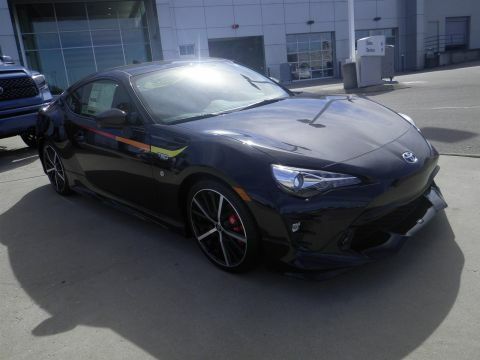 86 comes with a close-ratio 6-speed transmission for breathtaking acceleration and impressive fuel economy. The sequential automatic transmission features a manual shift mode, letting you select the gear you want via the gear-select lever or steering wheel-mounted paddle shifters. For those who prefer three pedals, the manual transmission gives short, precise throws for a driving experience like no other. The rear differential in manual transmission-equipped models incorporates a set of gears with a 4.30:1 ratio. Designed for heightened response, this rear diff helps improve low-end acceleration. This gearing also helps keep 86 in its performance “sweet spot” while in the twisty stuff, making it easier to accelerate out of corners. Designed for track days, 86’s unique Vehicle Stability Control (VSC)7 sport tuning allows the driver to shut off all stability assists. When on a racetrack, this Full-Off Mode prevents the VSC from kicking in, putting the driver in full control. This helps expert drivers push the envelope of 86 and extract every last drop of performance. 7Vehicle Stability Control is an electronic system designed to help the driver maintain vehicle control under adverse conditions. It is not a substitute for safe and attentive driving practices. Factors including speed, road conditions, weather and driver steering input can all affect whether VSC will be effective in preventing a loss of control. See Owner’s Manual for additional limitations and details. The automatic transmission-equipped 86 comes standard with steering wheel-mounted paddle shifters. Just a simple pull of the lever allows the driver to quickly change gears while keeping both hands on the wheel. This automatic transmission is intelligent, too—it will automatically rev-match when downshifting, giving you buttery-smooth gear changes. A global icon, the AE86 Hachi Roku Corolla helped cement Toyota’s racing cred. With its light body, Rear-Wheel Drive (RWD) chassis and nimble handling, the AE86 was a force to be reckoned with on the track and the streets. It inspired generations of enthusiasts and the car remains a legend to this day. Toyota took this AE86 DNA and gave it a modern twist to create our purest sports car yet—the 2018 Toyota 86. It’s everything a sports car should be, backed by Toyota’s proven technology. And it’s how we carry the 86 legend forward to the next generation. Let’s fire it up. Born on the track. Bred for the streets. 86 features multi-link rear suspension, plus front and rear stabilizer bars. These work together to help sharpen turns and enhance grip over uneven surfaces, enabling you to carve those corners with surgical precision. And when the drive calls for calmer inputs, like when cruising in the city, this suspension is supple enough to let everyone ride in total comfort. The body of 86 was engineered to be as light and strong as possible, helping boost efficiency and overall performance. What’s more, this unit-body design also puts the engine low to the ground, helping optimize the center of gravity for a truly balanced driving experience. Intelligent use of high-strength materials, reinforcement of key chassis areas and additional strategically placed spot welds help enhance the body strength of 86. And with this strength comes improved body rigidity, which helps reduce unwanted noise, harshness and vibration. Better yet, this strength also works as a performance enhancer, giving 86 exceptional acceleration, braking and handling capabilities. When on a racetrack, holding the Vehicle Stability Control (VSC)7 button for one second engages Track Mode, which helps you push the limits of performance. When in Track Mode, the system allows you to approach the handling limits of 86 before the VSC kicks in, after which the system helps to gently nudge you back on your desired driving line. 7. Vehicle Stability Control is an electronic system designed to help the driver maintain vehicle control under adverse conditions. It is not a substitute for safe and attentive driving practices. Factors including speed, road conditions, weather and driver steering input can all affect whether VSC will be effective in preventing a loss of control. See Owner’s Manual for additional limitations and details. Every 86 comes standard with Hill Start Assist Control (HAC).8 This convenient technology helps to keep the vehicle from rolling backward when switching from brake to accelerator on an incline. 8Hill Start Assist Control is designed to help minimize backward rolling on steep ascents. It is not a substitute for safe driving judgment and practices. Factors including speed, grade, surface conditions and driver input can all affect whether HAC will be effective in preventing a loss of control. See Owner’s Manual for additional limitations and details. SST9 helps reduce engine power when both the brake and gas pedals are pressed at the same time under certain conditions. The feature doesn't engage if the brake pedal is depressed before the accelerator pedal, allowing time for the driver to move from brake to acceleration. And for those track days, that also means that you can still heel-toe in the manual transmission-equipped 86 without any problems. 9Smart Stop Technology® operates only in the event of certain contemporaneous brake and accelerator pedal applications. When engaged, the system will reduce power to help the brakes bring the vehicle to a stop. Factors including speed, road conditions and driver input can all impact stopping distance. Smart Stop Technology® is not a substitute for safe and attentive driving and does not guarantee instant stopping. See Owner’s Manual for additional limitations and details. 10Vehicle Stability Control is an electronic system designed to help the driver maintain vehicle control under adverse conditions. It is not a substitute for safe and attentive driving practices. Factors including speed, road conditions, weather and driver steering input can all affect whether VSC will be effective in preventing a loss of control. See Owner’s Manual for additional limitations and details. 11Brake Assist is designed to help the driver take full advantage of the benefits of ABS. It is not a substitute for safe driving practices. Braking effectiveness also depends on proper vehicle maintenance, and tire and road conditions. See Owner’s Manual for additional limitations and details. 12Smart Stop Technology® operates only in the event of certain contemporaneous brake and accelerator pedal applications. When engaged, the system will reduce power to help the brakes bring the vehicle to a stop. Factors including speed, road conditions and driver input can all impact stopping distance. Smart Stop Technology® is not a substitute for safe and attentive driving and does not guarantee instant stopping. See Owner’s Manual for additional limitations and details. 13All the airbag systems are Supplemental Restraint Systems. All airbags (if installed) are designed to inflate only under certain conditions and in certain types of severe collisions. To decrease the risk of injury from an inflating airbag, always wear seatbelts and sit upright in the middle of the seat as far back as possible. Do not put objects in front of an airbag or around the seatback. Do not use a rearward-facing child seat in any front passenger seat. See Owner’s Manual for additional limitations and details. *MSRP excludes the Delivery, Processing, and Handling Fee of $920 for Cars (Yaris, Yaris iA, 86, Corolla, Corolla HB, Camry, Camry HV, Prius LB, Prius c, Prius Prime, Mirai, 86, 86 HV), $1045 for Small/Medium Trucks, SUVs and Van (C-HR, RAV4, RAV4 HV, Highlander, Highlander HV, 4Runner, 86, Tacoma), $1,295 for Large SUVs (Sequoia, Land Cruiser), and $1,395 for Large Truck (86). (Historically, vehicle manufacturers and distributors have charged a separate fee for processing, handling and delivering vehicles to dealerships. Toyota's charge for these services is called the "Delivery, Processing and Handling Fee" and is based on the value of the processing, handling and delivery services Toyota provides as well as Toyota's overall pricing structure. Toyota may make a profit on the Delivery, Processing and Handling Fee.) Excludes taxes, license, title and available or regionally required equipment. The Delivery, Processing and Handling Fee in AL, AR, FL, GA, LA, MS, NC, OK, SC and TX will be higher. The published prices do not apply to Puerto Rico and the U.S. Virgin Islands. Actual dealer price will vary.